Remembering the Angelina County Courthouse in Lufkin, Texas. More than any other structure, a courthouse is the most endearing symbol of a county's history in Texas. And they're usually among the most imposing buildings in the county seat. But in the l950s, many Texas counties threw aside history, tradition and elegance and replaced some of our finest courthouses with modern buildings--many of them with little character or appeal. That happened in my home town of Lufkin. The Angelina County Commissioners Court decided that its fifty-year old courthouse, resplendent with a dome and a clock, was inadequate to meet the county's needs. 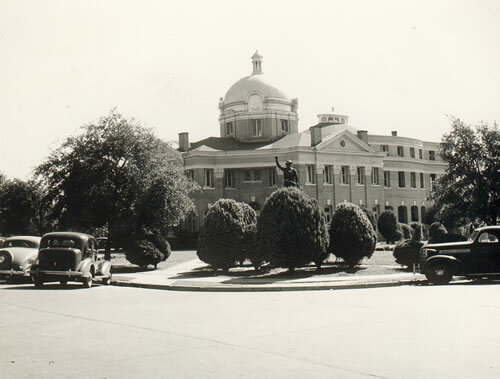 Following a bond election to fund a new courthouse, the county demolished the old courthouse without ceremony in 1953. Today, to a generation of Angelina County residents who fondly remember the old courthouse, it was the wrong thing to do. 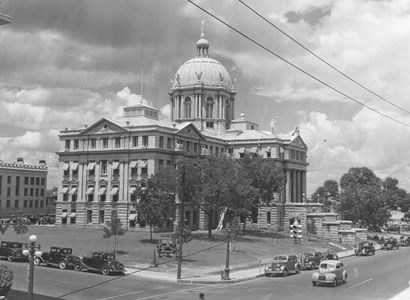 And the error has now been compounded by the discovery that our old courthouse was designed by one of the most famous architects in America -- James Riley Gordon, the man responsible for the designs of eighteen Texas courthouses during two decades of practice in Texas. Today, twelve of the landmark Gordon courthouses are still standing in Bexar, Comal, Ellis, Erath, Fayette, Gonzales, Harrison, Hopkins, Lee, McLennan, Victoria, and Wise counties. Ten are still serving their original purpose. A native of Winchester, Virginia, Gordon moved with his parents to San Antonio in 1874 and worked with his father, a civil engineer. But he loved architecture more and began studying with the widely-admired firm of W.C. Dobson and J.N. Preston. He also worked in the office of the U.S.
Supervising Architect in Washington before embarking on courthouse designs. In Texas, Gordon progressed from a charming and eclectic style in the Moorish manner into a highly effective Romanesque style. His version of this style is seen at its best in the courthouses of Wise, Ellis and several other counties. During his latter years, Gordon employed a Classical or Beaux-Arts style and his courthouse designs at Lufkin, Marshall and Waco were outstanding examples of this work. In fact, if you visit the McLennan County Courthouse at Waco, you can see some of the same features that made Lufkin's courthouse admired. The Waco courthouse was completed in 1901. At the time Gordon was working on the plans for Lufkin's county edifice, which was completed two years later. Visiting the Waco courthouse, the similarities with Lufkin were apparent. Both had soaring domes, topped with small cupolas. Both had classical arches over each wing and the window designs of each building were similar. Borrowing another Waco feature, Gordon's design at Lufkin included a clock in the dome structure. But when Angelina County's new, box-like courthouse was dedicated in 1955, it lacked an outside clock. Bowing to public pressure, the commissioners court had the builder place a $1,400 modernistic, numberless clock on the front of the boxy, new courthouse, but it was hidden by a large oak tree--which the county proposed to cut down. But, again, the public spoke out and in a newspaper poll, a 693-194 majority decided to keep the tree. So the new clock remained shrouded by the tree until a ladies' beautification group decided to trim the trees in 1966. When the limbs came down, the courthouse clock was visible for the first time in years. But its belated victory was a hollow one. The clock hadn't worked at all in ten years. Today, in a touch of irony, the tree is dying -- and the clock is working. Distributed by the East Texas Historical Association. Bob Bowman is a former president of the Association and the author of 30 books about East Texas.